Far East: The Relationship of the Altaic and Türkic Languages. + Nostratic Languages. Ethnogenetic Processes in East Europe and Asia till the Bronze Age. + Ethnogenetic Processes at the Iron Age. The Sino-Tibetan family consists of about 300 languages, what immediately casts doubt on the possibility of studying them by the graphical-analytical method, without pre-classification them by methods is purely linguistic. This problem is still not fully resolved, but seven of these languages were singled out by the project "Tower of Babel" and their etymology was presented there in tabular form. Such a representation allowed us to reflect on the relationships of these languages in a graphic form. In total, the database included 2,775 roots for the following languages: Chinese, Tibetan, Burmese, Kachin, Lushai, Lepcha, and Kiranti. 91 roots from them can be considered as common to all these languages, and 174 occurs in only one of them. All they were excluded from the list that was used for counting the number of common words in pairs of languages. These data are shown in the table. The total amount of words of each language taken for analysis is shown in the diagonal of the table. Immediately, the disproportion for the Kiranti and the Lepcha languages compared to the others are small. There may be various reasons for such disproportion. Perhaps these languages have not been sufficiently studied; may be the ancestors of their speakers lived far enough away from the rest of the Sino-Tibetan in enclaves; maybe these are speakers among of another language family; or maybe these are lost part of an ancient vocabulary. There are other possible causes, but one way or another, the two languages do not fit into the graphical model of kinship Sino-Tibetan languages, although, of course, they are genetically closely related to them. The graphic model of the relationship of the Sino-Tibetan languages is shown at left. This version of the model (but not its mirror reflection) was chosen because it meets to some extent modern-day places of settlement of Tibetans, Chinese and Burmese. As you can see, the points for each language is located fairly compact. What testifies to the correctness of the lexical material is the adequacy of the representation of their kinship system. It was assumed that the Sino-Tibetan Urheimat was somewhere in Central Asia or the Far East. However, the search for a place on the map suiting this scheme there failed. Apparently, there is no such place in this part of Asia at all. The scheme configuration bears certain similarity to the scheme of the Nostratic languages; and thus both could be comparable to each other provided that the Lepcha or Kiranti languages area were settled down southward to the Burmese and Kachin languages area. And there’s a rationale to that hypothesis, though, since the linguistic investigations illustrated, in some way, the compliance of the contemporary settlement areas of related peoples crop with a certain extent to the location of their Urheimats at the time of their languages formation. Actually, the speakers of the languages Lepcha and Kiranti live closer to the Burmese than to the Chinese. The Lepcha are the indigenous people of the State of Sikkim, India located between Nepal and Bhutan. The Kiranti people are dwelling in Nepal. All this is not far from Burma but then, also from Tibet too. This suggests that the affinity of the Sino-Tibetan languages with the hypothetical arrangement of the Lepcha and Kiranti languages can be graphically reflected, as shown in the diagram above. If we compare this scheme with the scheme of kinship of Nostratic languages, then their similarity does not raise objections (see the diagram below). Accordingly, we have reason to locate the Urheimat of the Sino-Tibetans around the three lakes Van, Sevan, and Urmia (Rezaye) in Asia Minor where we located the Urheimat of the Nostratic languages (see map below). The idea about the Urheimat of the Sino-Tibetan people in Western Asia is not new. French scholar Terrien de la Couperie (1845-1894), the author of the book "The Early History of Chinese Civilization" had found a distinct resemblance between the Chinese and the early Akkadian hieroglyphics. In addition he demonstrated lexical correspondences between the Chinese language and Babylonian dialect of Akkadian which was used by people in Chaldea. Other affinity found by him were the correspondence between the Chinese and those of Elam and Chaldea. The idea about the Urheimat of the Sino-Tibetan people in Western Asia is not new. French scholar Terrien de la Couperie (1845-1894), the author of the book "The Early History of Chinese Civilization" had found a distinct resemblance between the Chinese and the early Akkadian hieroglyphics. In addition he demonstrated lexical correspondences between the Chinese language and Babylonian dialect of Akkadian which was used by people in Chaldea. Other affinity found by him were the correspondence between the Chinese and those of Elam and Chaldea. These discoveries lay in the basis of his theory about Elamite origin of the Chinese forefathers. He found many place names which could trace en route that some tribes have come from Western Asia to the Yellow River Valley. C. J. Ball developed and supplemented the research of Terrien de la Couperie and tried to convince the learned world about the western origin of Chinese system of writing and about the connection between Chinese and ancient Accadian languages. In future, several arisen theories pointed the Chinese Urheimat to Babylonia or even to Egypt. However other scholars, for example, Herbert A. Giles, considered Couperie's theory as a nonsense (AYLMER CHARLES, 1997: 25) and E. H. Parker saw no connection between Chinese and Akkadian or Egyptian forms of writing (WILLIAMS E.T., 1918, 208). E. T. Williams considered in detail the theory of the Chinese Urheimat in Central or Western Asia in his article "The origins of the Chinese" published in "American Journal of Anthropology" in 1918. He noted that it was difficult to separate the facts given by Terrien de la Couperie and his guesses but he was certain that de la Couperie's theory "enables us to give a very satisfactory explanation of the striking similarity between the language of ancient China and that of the Sumerians and the still more striking similarity between the ideographic symbols of the two peoples"
Anthropological differences seem to contradict the idea of any connection between Chinese and Babylonians but L. W. King noted obliquely-set eyes of figures in early Sumerian reliefs. 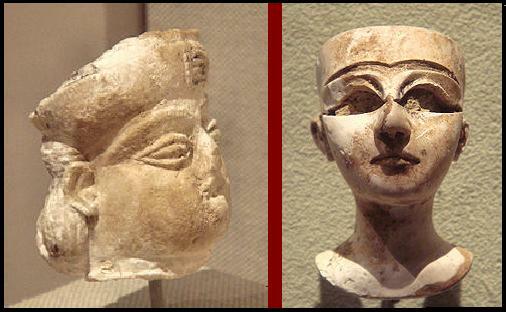 Left: Statue of a notable Sumerian. Lagash. Circa 2500 BC. 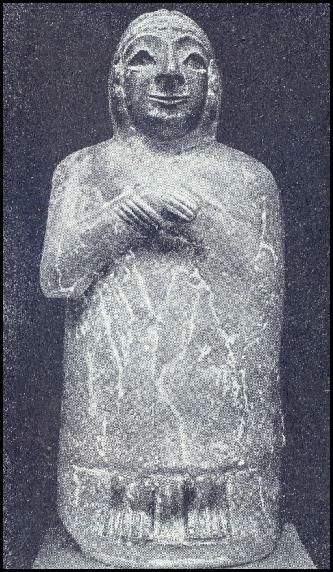 The statue shows a man with slightly obliquely-set eyes. This could be a sign of the cross-breading between Caucasoids and Mongoloids. What this sign is expressed rather weakly and could be explained that Mongoloids left Sumeria some millenniums before. We have, then, the facts that various Chinese tribes appear to have come in to what is now China from some region to the northwest of that country, and that the Sumerians appear to have come into the Euphrates Valley from some place to the northeast of Babylonia; that the Sumerians were apparently of the Turanian race, and that their language and their script are strikingly like those of the ancient Chinese; and that extensive changes in the climate of Central Asia have driven out at different periods great numbers of the inhabitants who have migrated in various directions. It does not seem at all improbable then that the Chinese forefathers and the ancestors of the Sumerians may have been related and may have migrated from neighboring regions, the Chinese toward the east and the Sumerians toward the west (WILLIAMS E.T., 1918: 211). … it seems to me that while some of the principles underlying Chinese writing are in fact similar to those underlying Sumerian writing, in all probability the reason for this is not that one was influenced by the other. The distances in time and space, unlike the Sumerian-Egyptian and Phoenician-Greek situations.., militate against such a hypothesis. A more reasonable explanation is that the two peoples independently thought up somewhat similar solutions to somewhat similar problems (DEFRANCIS JOHN. 1989). However these distances could be shorter if remains of Chinese ancestors stayed on their Urheimat in West Asia after majority of them migrated eastward. The time of the stay of Sino-Tibetan people in their Urheimat should be attributed to the Upper Palaeolithic, because later this place was dwelt by the speakers of the Nostratic languages, which came here from the west, driving out the original inhabitants eastward and assimilating or killing what remained. The Sino-Tibetans moved to Central Asia, where they became the creators of the local Mesolithic cultures. They arrived to current places of habitat as early as the Neolithic or it was brought with them, since neither in China nor Burma reliable traces of Mesolithic period were not found. 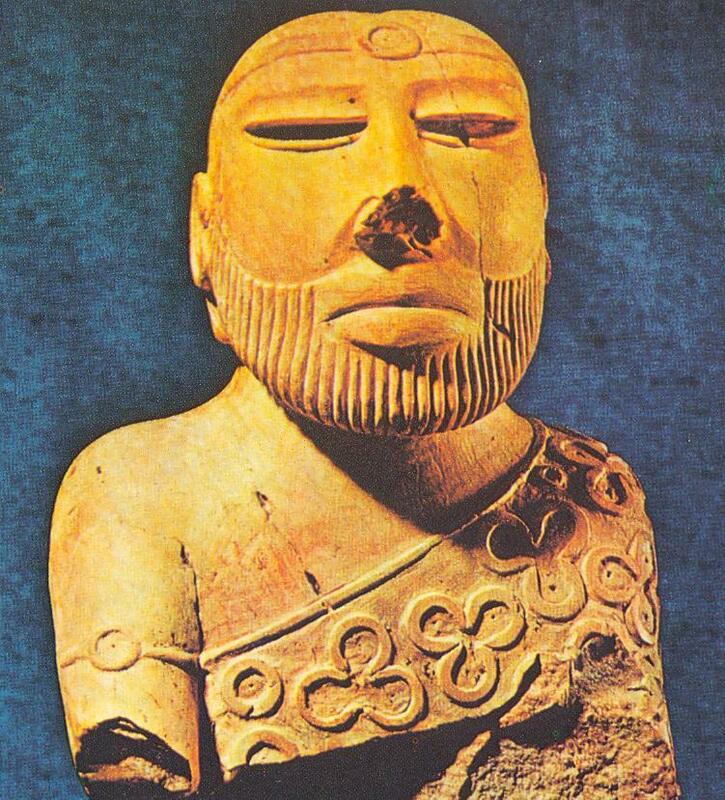 Statue of a bearded priest from Mohenjo-daro. Obviously, people of the Mongoloid race were living in Central Asia before the arrival of the Dravidians. They could be the creators of the Bronze Age civilizations, such as Harappa (centers – Rakhigarhy, Mohenjo-Daro, Harappa, Lotkhal, Dholavira in Pakistan and India) and the Bactria–Margiana Archaeological Complex (Gonur-depe, Namazga-Tepe and Altyndepe In Turkmenistan). The Harappan civilization existed approximately in 3300-1300. BC, and Bactrian-Margiana, having emerged simultaneously with the Harappa, ceased to exist for half a millennium before. It can be assumed that their decline is associated with the arrival of the Indo-Aryan tribes in Central Asia. The presence of Mongoloid features in the sculptural portraits found during excavations of the monuments of these civilizations may indicate that the people of the Mongoloid race after their migration from the Near East had found places for settlements in the Indus valley and on the banks of the Murgab, the Amu Darya, and the Syr Darya Rivers. Apparently, under the pressure of the Indo-Aryans, they had to migrate farther to the east. It is clear that the Sino-Tibetans belong to the yellow race, to which also belonged the Indians of America, and the peoples of the Mongolian and Manchu-Tungus language groups. Since the languages of these latter do not contain clear signs of kinship with the Sino-Tibetan, i.e., they were formed very far from the settlement of the Sino-Tibetans, we have to assume that people of yellow race inhabited a vast area in Asia at time when human language was at its initial phase of formation. We adhere to the hypothesis of monocentrism, according to which, modern man emerged in the Near East and the Mediterranean as a result of the mixing of different representatives of the Neanderthal type. Typological heterogeneity of peoples of different races in the Upper Paleolithic was smaller than it is now. (SHCHOKIN HEORHIY, 2002: 77). In other words, the difference between the prototypes of Caucasoid and Mongoloid races were insignificant and they were living in the same environmental conditions of Southwest Asia. After the Mongoloids migrated along the broad expanse of Asia, their original phenotypic traits developed into different ways under the influence of natural conditions of different habitats. The result of their difference from the white race has increased, but at the same time two distinct racial types were developed, which gave rise to a modern Mongoloids and Amerikanoids.